HELP! MY CARD IS ON THE BLACK LIST! -Expired “after” you rented, but “before” you returned your movie. -Was “declined” for default movie sales - automatic blacklisted. -Associated with any abuse of our service, payments, DVD’s, etc. -Another DVDNow kiosk owner may have black listed the card. If your card was not black listed by another owner, we might be able to reinstate it; call to find out what the problem is and how to correct it. -Deep scratches. Please call us immediately, so we can take care of you! -Certain Blu-Ray machines may need an internet update; some simply have problems we can’t explain! -Standard DVD players will not play a Blu-Ray. -If you have purchased your movie directly from the machine (not default sale) please call us within a five days of the purchase. -We have several machines that movies can be rented from and then returned to any of our other locations. This often causes too many of one title to show up in one machine and few or none in another. We try to rearrange them all every Tuesday, but can only do this with movies that are actually “in” the machines. -Reservations may be made on our website. The movie must be in the machine, as we can’t guarantee someone will bring a movie in that is out. It can be reserved for 12 hours; a one day rental fee will be charged whether it is picked up or not. Sorry-coupon codes cannot be used for reservations. WHY WAS I CHARGED SO MUCH? 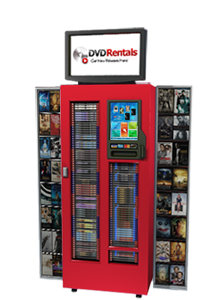 -Rental rates for DVD’s and Blu-Rays are per night as shown on the machine, plus tax. This applies to rentals up to 14 days. -Rentals kept for 15 days convert to a sale (total rental fees, plus sale price based on the day you rented the movie, plus tax). -Sale price is whatever is shown on the screen when you choose to purchase the movie “now”. -We charge at least $10 dollars for any declined charges per rental that we haven’t been able to collect for a month-this is subject to change any time. We also reserve the right to add to these charges for further late payment, collections, etc. -Occasionally, movies are taken to non-DVD BY THE SEA machines. Often this is due to someone other than the renter in the family returning them, not realizing they belong to us. These turn into a default sale if not returned to our machine before the 15th day. If this is the case, please contact the other store managers or DVDExpress directly. If you are able to retrieve the movie in a reasonable timeframe, we will try to work with you for a partial refund, coupons, etc. -Free rentals can turn into a charge, if not returned by the following day by 6pm. -Damage and other fees may also apply. We’ll try to post more FAQ’s on occasion!